The giant panda, also known as panda bear or simply panda, is a bear native to south central China. It is easily recognized by the large, distinctive black patches around its eyes, over the ears, and across its round body. 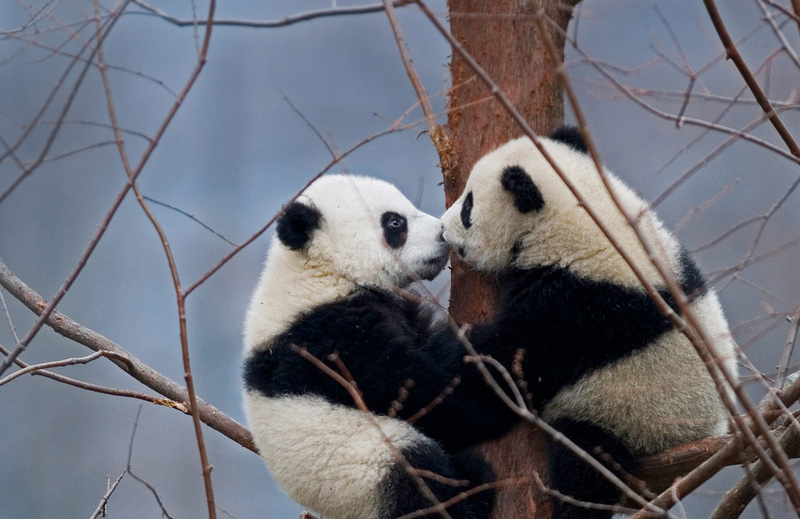 On International Kissing Day, take some inspiration from these two adorable panda cubs, nuzzling in a tree in their native country, China. This unofficial holiday is all about smooching your loved ones. When you’re done with that, consider how else you might spread some love—perhaps to our panda friends. It’s estimated that fewer than 2,000 giant pandas remain in the wild. Organizations like the World Wildlife Fund are working to protect their habitat, and your support can make a difference. Did you know: The giant panda's scientific name is Ailuropoda melanoleuca, which means 'black and white cat-foot'.